One of the great things about living in or traveling to Korea in the spring time is the endless number of events that are held throughout the country. With the arrival of cool, sunny weather comes a slew of outdoor performances and fun festivals that allow visitors to more personally experience Korea's colorful culture. Not only do I enjoy participating in said events, but I enjoy sharing my experiences with others, particularly through this blog. Blogging has become quite a fun hobby for me so when I was presented with the opportunity of joining the Korea Tourism Organization's K-Supporter team, I jumped at it. The K-Supporters are a group of international residents living in Korea who are given "missions" to promote Korean culture. Upon successful completion of these tasks, K-Supporters are rewarded with special access to events. Our first assignment was to attend the R-16 Goodwill Ambassador Orientation Ceremony this past Monday at the KTO building in Jongro-gu. I arrived a bit late due to time conflicts with my work but arrived just in time to catch the beginning of the ceremony. The event was MC-ed by two television personalities from Arirang TV who were kind enough to include English commentary so the international visitors could understand. Lee Charm, CEO of the Korea Tourism Organization, soon joined the MCs to welcome attendants and make some announcements about the KTO's upcoming projects. I was pretty pumped to learn that over the next few months, free performances will be held every Wednesday and Friday during lunchtime at the KTO building (click here for directions). In addition to the performances, the KTO will also be airing Arirang TV K-pop performances on the big screen in front of their office in the evenings. Mr. Lee Charm was also sure to mention the Rush Ticket desk in the basement of the building where tourists and residents alike can purchase discounted, same-day tickets (up to 50% off!) 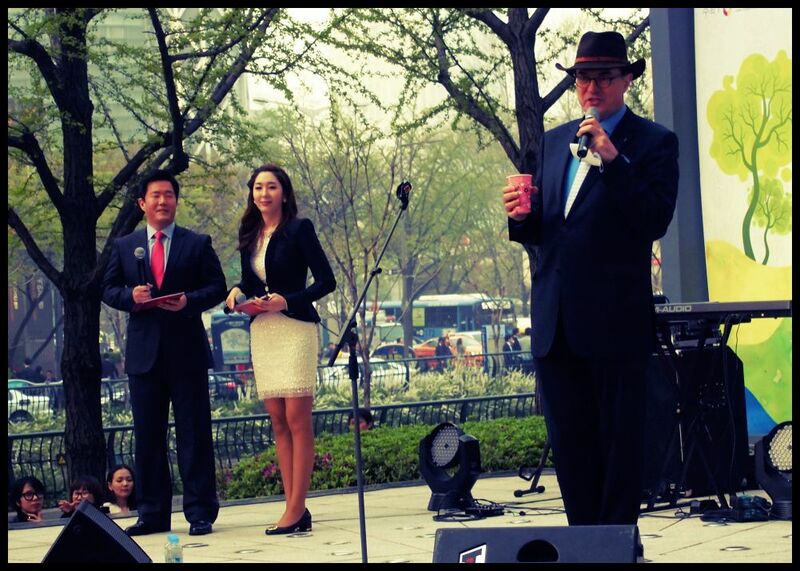 for many of the outstanding non-verbal shows throughout Seoul. Lee Charm welcomes visitors and announces the upcoming KTO events. After a toast, Jay Park (a.k.a. Park Jae Bom) was welcomed on stage to receive the Goodwill Ambassador award for promoting the upcoming R-16 B-boy competition. B-boy culture has become huge in Korea and Korean breakdancers are some of the best in the world. The R-16 event brings competitors from all around the world to Seoul for a dance-off of epic proportions. Last year's event was broadcast in over 100 countries, so it's safe to say that this event is pretty big. Jay Park was an excellent choice to be the representative of this event. In addition to being oober-famous as a K-pop star around the world, he has also been a b-boy since 2007. On stage, he noted that although K-pop and breakdancing aren't usually genres that mix well, he makes it work. And I don't blame him for being prideful of that. The boy's got talent. Jay Park receives his Goodwill Ambassador plaque. After receiving his plaque and a cool piece of graffiti art, the K-Supporters were brought up to the stage to be inaugurated. We took a photo with Lee Charm and Jay Park, bombarded with camera flashes from all directions. 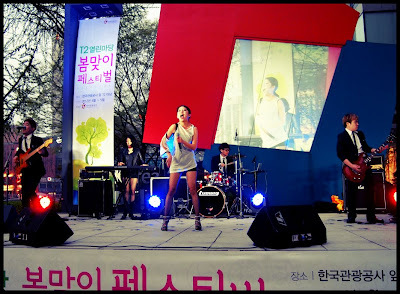 The event concluded with a performance from a Korean rock band who drew in passerby from the street with their electric music and powerful vocals. The KTO sure did a good job at throwing an awesome party and I look forward to more of them in the future. I 'm pretty sure Jay Park was lovin' that graffiti art. A Korean band rocks out at the KTO Building in Jongro during the event. Keep an eye out for my K-supporters segment coming soon and be sure to check out the KTO website for more exciting opportunities and events happening throughout Korea this season!